An investigation into Verify, the government's identity verification platform. It examines its performance, costs and benefits. 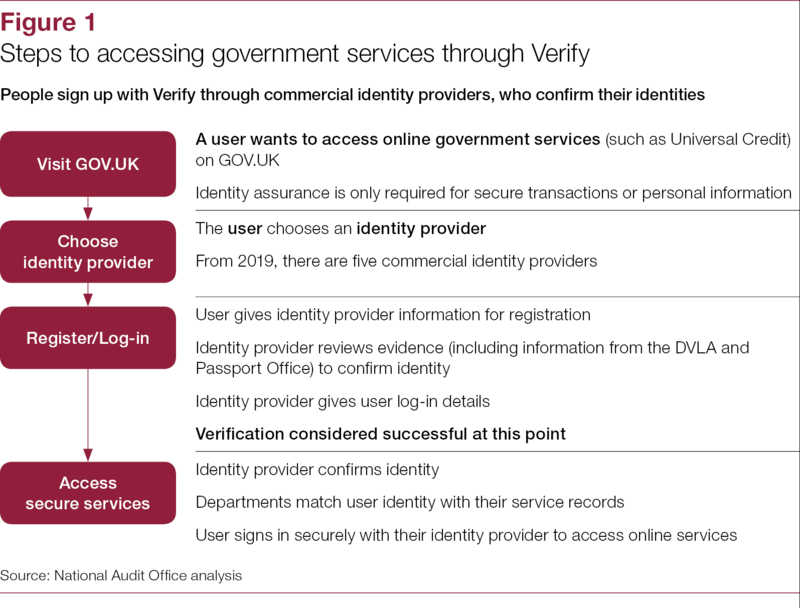 GOV.UK Verify (Verify) was intended to be a flagship digital programme to provide identity verification services for the whole of government. 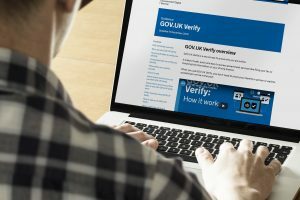 People sign up for Verify to prove their identities, so they can securely access online government services such as Universal Credit or to claim a tax refund. Verify uses commercial organisations to verify people’s identities. 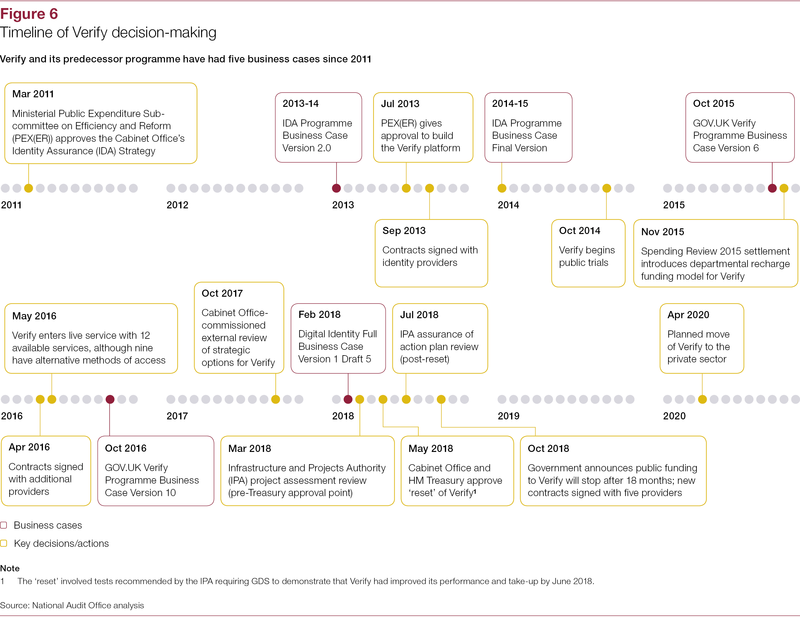 The Government Digital Service (GDS) considers it to be a strategically ambitious programme. In its 2016 business case, GDS identified the following key targets and expectations for the platform: 25 million people would use Verify by 2020, and 46 government services would be accessible through Verify by March 2018. In October 2014, GDS began public trials of Verify with a small number of government services. 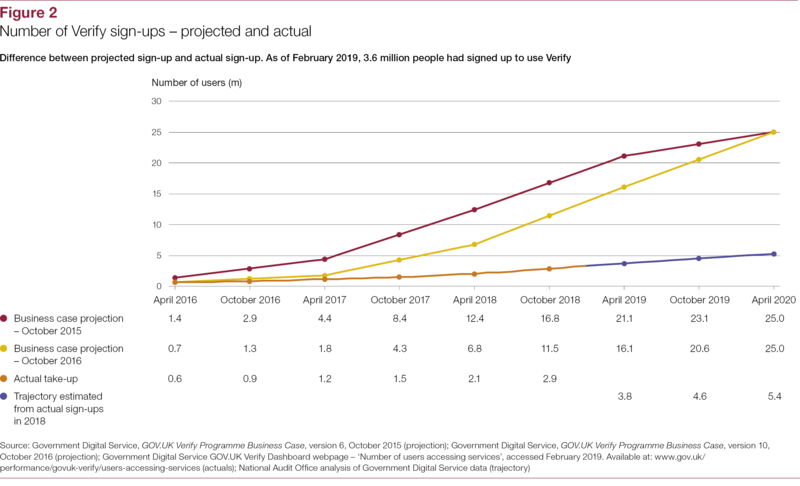 It has since added more government services, and 3.6 million people have been verified by February 2019. The performance of Verify has consistently been below the standards set out in each of its business cases. 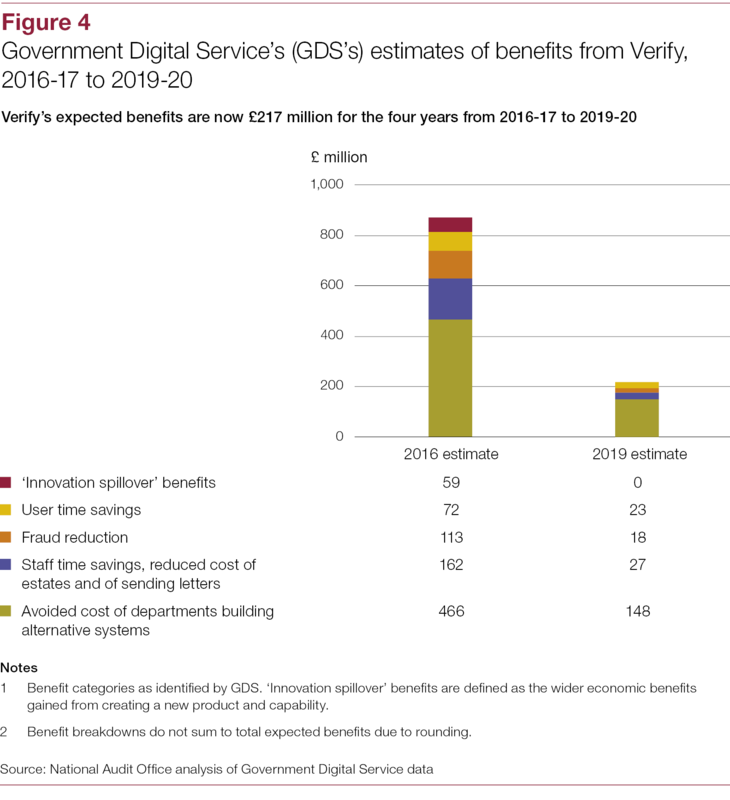 GDS intended that Verify would be largely self-funding by the end of March 2018, but low take-up means that government continues to fund it centrally. The Cabinet Office announced in October 2018 that government would stop funding Verify in March 2020. It has capped the amount it will spend on Verify during this time to £21.5 million. 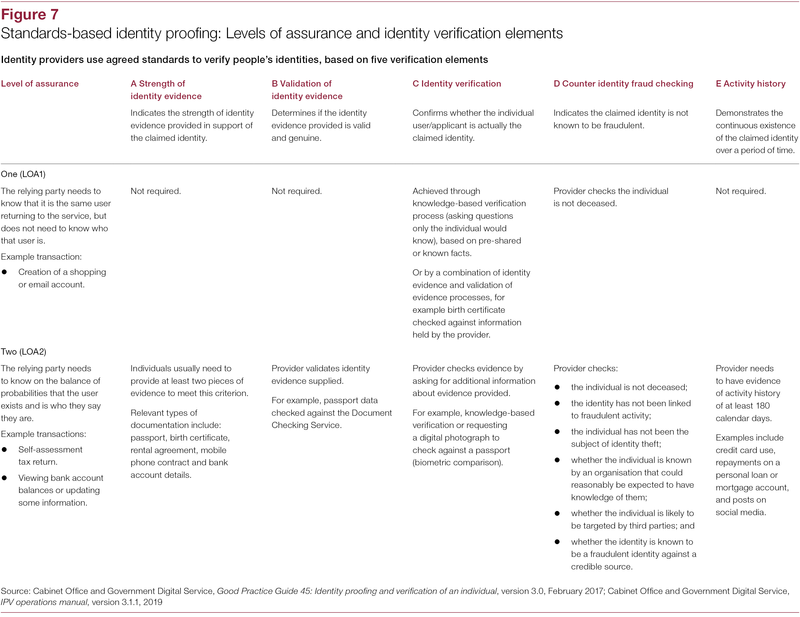 GDS has confirmed 18-month contracts with five commercial identity providers who will continue to verify people’s identities. After March 2020, GDS’s intention is for the private sector to take over responsibility for Verify. This report follows on from the NAO’s previous work on Verify in the Digital transformation in government report. 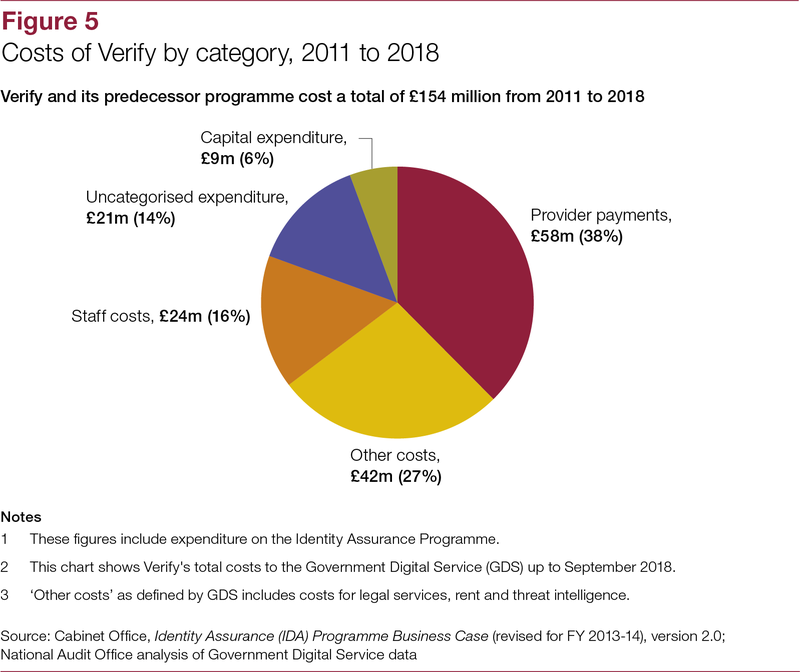 This found that take-up of Verify had been undermined by its performance and that GDS had lost focus on the longer-term strategic case for the programme. how Verify will operate in the future and the implications for government services currently using Verify. 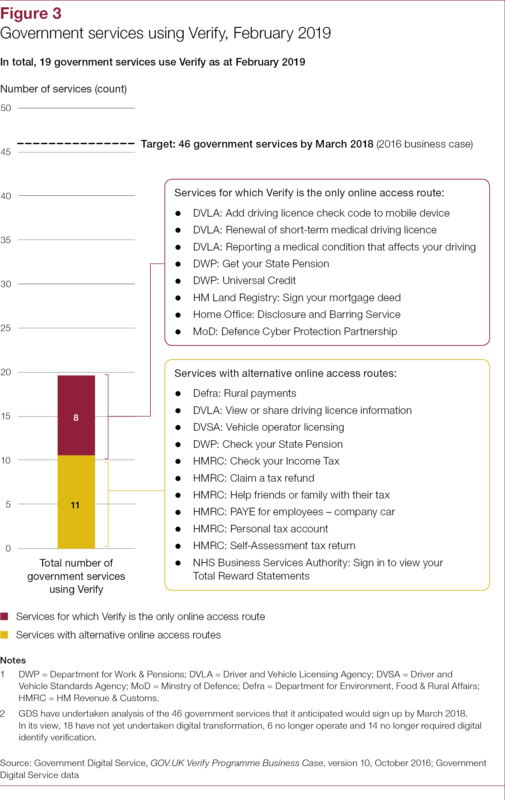 In many ways the Verify programme is an example of how government has tried to tackle a unique and unusual problem, adapting over time in response to lessons learnt and the changing nature of the external market. Government has identified fraud as a growing threat across the modern economy, both within and beyond the public sector, and that confidence in identity is an important element of protecting services and users. In an attempt to strengthen online identity while maintaining a high degree of privacy, GDS has helped to define standards, build the Verify platform, and develop the market of private sector identity providers. After struggling to build demand within the public sector for Verify, government has now decided to hand over control of Verify to providers from 2020 with the aim of encouraging its use for non-government services, to deliver wider benefits and build scale that may benefit government in the longer term through lower prices. Unfortunately, Verify is also an example of many of the failings in major programmes that we often see, including optimism bias and failure to set clear objectives. Even in the context of GDS’s redefined objectives for the programme, it is difficult to conclude that successive decisions to continue with Verify have been sufficiently justified.